Obituary for Albert Leslie Blackett | Frank R. Bell Funeral Home, Inc.
Albert Leslie Blackett was born on September 19 1929 in NY to the late Albert E. and Wortley G. Blackett. 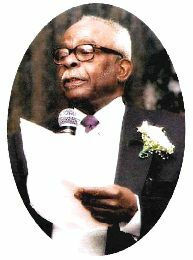 His mother returned to Barbados with her children where Albert was raised and educated. He returned to the US at the age of 19 and was quickly drafted into the US Army where he was stationed in Korea. After returning home, he remained as a Reservist on Active Duty until 1955. Albert married his childhood sweetheart, the late Dorothy Blackett and from this union they had three children, Selby (deceased). Floyd and Arlene. While supporting his family, Albert obtained his Bachelor of Science in Mathematics, from Brooklyn College and Master Degree in Sociology from Fordham University. He later obtained a Post Graduate Certificate in Psycho Analytic Psychotherapy and Counseling from the Brooklyn Institute for Psychoanalysis. During this time, he worked various jobs including working for Girl Scouts USA. Albert was very passionate for God and exemplifed love for HIM in his daily living. He loved discussing the word of God. He cared compassionately for others, helping to provide for their needs selflessly. Albert and Dorothy were a team, one could not do without the other. Together they provided a warm, funny, loving and welcoming environment. He had an exotic palate for savoring different delicacies while he enjoyed cooking for and with others. Albert took pleasure in gardening and harvested plenty of produce that he shared with family and friends. He enjoyed music; both listening and playing (clarinet and piano) and had a flare for dancing. Albert leaves in God’s hands his children Floyd Blackett (Gina), Arlene Blackett-James (Michael), his siblings Muriel Blackett and John Blackett, his grandchildren Michelle James-Jordan (Akil). Christopher James and Britney James, his great-grandchildren Xavier and Xavion, and a host of nieces, nephews, cousins, in-laws and friends.